i think it's funny how plans go. you decide on something intently and then later, laugh at yourself, sometimes through tears, that life has brought you different mountains to climb. 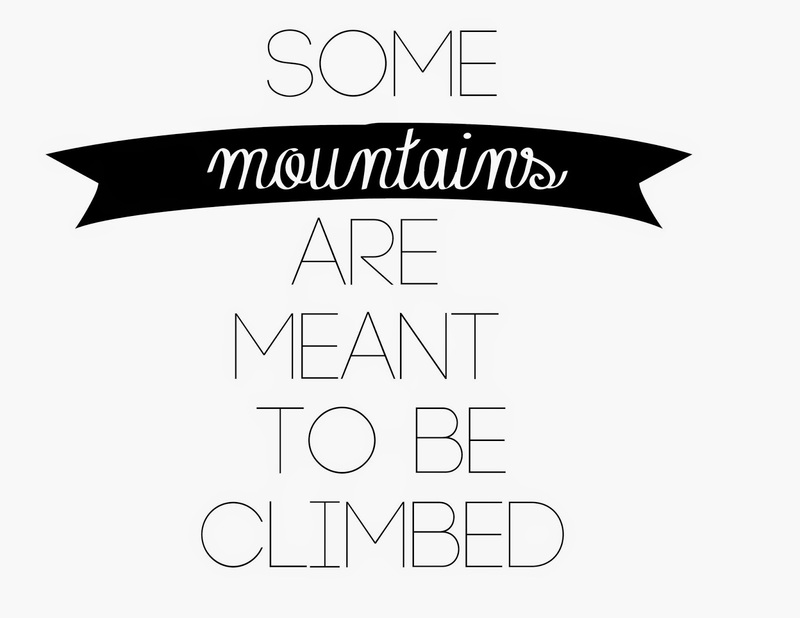 there's a phrase out there, choose the mountains you want to climb carefully. and while i agree that there are lots of mountains we can choose, some mountains are put right in front of us with no way around them. mountains chosen for you. mountains with no discernible path. mountains meant to be climbed, not walked around. this is where we find ourselves. i told you guys a while ago, i felt like this was coming. we had a wonderful season of rest. it was characterized by a lot of gratefulness and a lot of rest. time together. redemption of time lost. binding up of wounds, wincing at the pain of the bandage but marveling at the gashes healing, one by one. and now he is doing something new. i knew where we were going. is this what issac felt like going up on the mountain with his dad? something is going to happen and it will be difficult, but what will it be? i wasn't sure, only that i was with my father and that he is trustworthy and good. and then it hit us. all at once. all the everything. the let's-get-that-husband-a-promotion-he-never-asked-for-with-the-crazy-hours-he-never-wanted-sell-our-house-in-a-day-move-to-the-suburbs-help-plant-a-church-write-a-book-have-a-baby-at-the-same-time-while-moving-and-managing-three-children kind of crazy. it makes complete sense. (sarcasm oozing). 1)in God's kindness he let us know it was about to get nuts. why does he even care about us in this way? 2)in that same kindness, he has let the storm completely overwhelm us. there is no way to get to where we need to be but to climb a giant mountain, in a storm, and only see the few inches in front of us. his mercy is full here, on this arduous climb. each step, has been planned. and He has always made a way for weary travelers, hasn't he? i know i won't even climb this whole mountain or even a small part of it, there will be a lot of him carrying me. and not in the cheesy footprints in the sand kind of way, but in the blood falling from his brow for me kind of way. in light of his goodness on the cross for me thousands of years ago, i know i can trust in his goodness now. he laid down his life for me in the greatest act of generosity, trustworthy-ness, and kindness in all of history, so he'll do this too. he carried the cross up the hill and now he'll carry me up this mountain. and when i look into his face, i remember who i am. because without the storms, i had forgotten. if ever it was said that there are situations which make us feel small, it is now. there's no question of who is doing the work on this mountain. Wow, I really needed this today. Thank you. Thank you. You are spot on. He's got this girl, hang on tight! I thought I was the only one who felt this way. I feel like our family is in the calm right now, in a season that is meant to be savored, but that God is preparing us for something big and wild, I'm not sure what it is yet, but I can trust that He will be there every step of the way! I will say some prayers for you all! that's why the idea of balance is crap! ha. seasons of crazy, seasons of rest...the pendulum goes back and forth. but i'm thankful we never have to fear what's around the bend. he is kind and good. "I hear him hushing me with his words, not you, me." I cried ugly tears...Excited to see how God uses your Nato clan in the coming months!! And, see all of your amazeball design/decor choices in the new pad (please no JoCo tan. please). agh. i'm sorry jumesha. i haven't been going to the gym so i haven't been able to catch up with you! This. I'm right there too. when I went through a similar stage in life, I had to constantly remind myself to take it a day at a time, sometimes an HOUR at a time. the big picture overwhelmed me, but if I focused on what needed to be done that day, that morning, etc. It seemed manageable. (with the Lords help, of course :) also, I once heard Gods grace described as an energy source, a wind turbine in the field of our lives, if you will. that picture reminded me that his grace is enough. also, lets talk church plant. I need deets. we just had friends plant a church from the ground up. It's definitely a time where you will need God's grace to sustain you but it is so, so worth it. Oh my goodness, every word of this went straight to my heart. I'm in the middle of a mountain range right now, and just needed this tonight. One of my favourite songs says "I will lift my eyes to the maker of the mountains I can't climb." and that is what I hold onto. Not me, Him. Thank you. yessss, i love that bebo song. Just when you feel a little bit satisfied that YOU'VE already climbed hard mountains, yes indeed, well then there are other totally unfamiliar ones He puts in front of us. This is what it feels like to me lately, like He is pressing in further and further, wanting more of me, more than I thought was there to give. More garbage than I realized was there to prune. And it doesn't feel good like a hard work out. It feels uncomfortable and unfamiliar and slightly painful. But I know how it all turns out, and I know that every moment I kneel to the pressing in is worth it. With you, and thankful for you. Jami Nato, bringing it home again. Seriously, I don't know what it is God does through you girl but it is good and it is a gift. Wow, I am thanking the Lord for you once again as I read this. It is posts like this (and stories of Lila, special needs kids have my heart) that keep me coming to this blog. I mean that and your totally raw and honest sense of humor. Geez, I'm just going to revel in how amazing your words from God are. I am learning lately how much I need him, and it is beautiful how often I am forced to turn to him because I have no other option. Thank you again for faithfully writing the words he gives you. i like you comparing yourself to isaac in this story, rather than abraham. i always wondered about isaac....i know he was old enough to understand plenty if he was out there helping his dad with a slaughter. i always wonder how he came back from that. "oh, you know, no worries dad. i forgive you for putting me on an alter with intent to sacrifice me. that's cool. let's go play some b-ball." i think maybe there is quite a bit more to the faith of ISAAC that we just don't discuss. so, i like that you did. and sometimes that is how we feel. trusting our Father when we know what He is asking will be really uncomfortable...and hard to trust Him. Jami- it's 2:31am and my family and I are going through a storm. The mountain is huge, big and I have felt so weary but I have also felt so much grace. I'm so thankful that despite the circumstances that have me up right now God led me to this. I might have to read this every day during this season- which may be very long and definitely will be very hard.